HomeAre contaminated hands more important than contaminated surfaces? Are contaminated hands more important than contaminated surfaces? Cast your minds back to the 2010 HIS conference in Liverpool and Drs Stephanie Dancer and Stephan Harbarth debating the relative importance of contaminated hands vs. surfaces in the transmission of MDROs. I don’t remember the details of the debate, but I do remember the surprising lack of evidence on both sides. Back then, we had no real way to quantify the contribution of the environment to the transmission of MDROs, or to measure the relative importance of contaminated hands vs surfaces. The evidence has evolved to the extent that a group of US researchers have published a paper modeling the relative contribution of contaminated hands vs surfaces to the transmission of MDROs. I like the paper very much, and the authors should be congratulated for breaking new ground in understanding transmission routes of MDROs. The model simulates patient-to-patient transmission in a 20-bed ICU. The values of the parameters that were used to build the model were sensible on the whole, although baseline hand hygiene compliance was set at 57-85% (depending on staff type and whether at room entry or exit), which seems rather generous when baseline environmental cleaning compliance was set at 40%. Also, the increased risk from the prior room occupant for MRSA and VRE was set at 1.4 (odds ratio) for both, whereas it probably should be higher for VRE (at least >2) based on a number of studies. 100 simulations were run for each pathogen, evaluating the impact of step-wise changes in hand hygiene or terminal cleaning compliance. The key finding is that improvements in hand hygiene compliance are more or less twice as effective in preventing the transmission of MDR A. baumannii, MRSA or VRE, i.e. a 20% improvement in terminal cleaning is required to ‘match’ a 10% improvement in hand hygiene compliance. Also, the relationship between improved terminal cleaning and transmission is more or less linear, whereas the relationship with hand hygiene shows relatively more impact from lower levels of hand hygiene compliance (see Figure, below). Thus, the line for improving hand hygiene or terminal cleaning would intercept and indeed cross over at around 40 or 50% improvement. The implication here is that hand hygiene is more important at low levels of compliance, whereas terminal cleaning is more important at high levels of compliance (although don’t forget the difference in the baseline compliance ‘setpoint’. Figure. The impact of percentage improvement in hand hygiene or terminal cleaning on the transmission of MDROs. Dotted line represents my not-very-scientific extrapolation from eyeballing the data. It had not struck me before that the level of compliance with hand hygiene and environmental cleaning are nearly identical, on average, with only around 40% of hand hygiene opportunities met and 40% of environmental surfaces cleaned if human beings are left to their own devices. Both of these figures can be improved considerably with concerted effort, but the sustainability of these improvements without continued effort is rather disappointing. The models address MRSA, VRE and MDR A. baumannii transmission. It’s a little strange that C. difficile was not included, since most consider this to be the ‘most environmental’ hospital pathogen. The study only modeled the impact of terminal cleaning, whereas daily cleaning seems likely to also be an important factor (which is acknowledged as a limitation in the discussion). This seems especially important in light of data that touching a contaminated surface carries approximately the same risk of hand contamination as touching an infected or colonized patient. I am not certain that this assumption makes logical sense: ‘thoroughness of cleaning of 40% implies that, given a single cleaning opportunity, there is a 40% probability that the room will be cleaned sufficiently well to remove all additional risk for the next admitted patient’. This would be true if cleaning was performed to perfection 4 times out of 10, whereas it is actually performed with 40% efficacy 10 times out of ten! To this end, it would be interesting to insert the various automated room disinfection systems into the model to evaluate and compare their impact. Indeed, hydrogen peroxide vapour has been shown to mitigate and perhaps even reverse the increased risk from the prior room occupant (for VRE at least). In the introduction, the authors comment that ‘A randomized trial comparing improvements in hand hygiene and environmental cleaning would be unethical and infeasible.’ I see what they’re saying here, in that it would be unethical by modern standards to investigate the impact of no hand hygiene or no environmental cleaning (although this has been done for hand hygiene), but it would be useful, feasible and ethical to perform a cluster RCT of improving hand hygiene and environmental cleaning. It would look something like the classic Hayden et al VRE study, but with an RCT design. How useful is mathematical modeling in informing decisions about infection prevention and control practices? This is not the first mathematical model to consider the role of the environment. For example, researchers have used models to evaluate the relative importance of various transmission routes including fomites for influenza. But a model is only as good as the accuracy of its parameters. Does this study help us to decide whether to invest in increasing hand hygiene or terminal cleaning? To an extent yes. 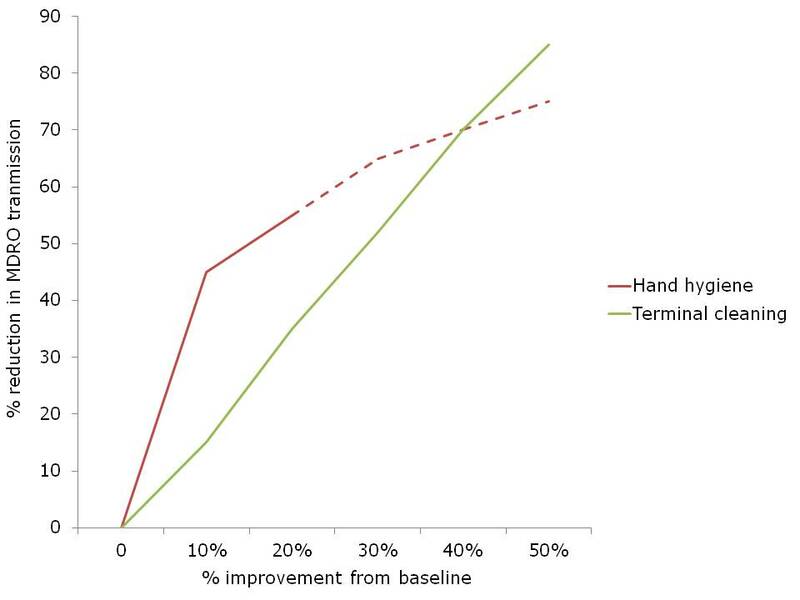 If you have awful compliance with both hand hygiene and terminal cleaning at your facility, this study suggests that improving hand hygiene compliance will yield more improvement than improving terminal cleaning (for A. baumannii, MRSA and VRE at least). However, if you have high levels of compliance with hand hygiene and terminal cleaning, then improving terminal cleaning will yield more. In general, this study adds more evidence to the status quo that hand hygiene is the single most effective intervention in preventing the transmission of HCAI. However, in a sense, the hands of healthcare workers can be seen as high mobile surfaces that are often contaminated with MDROs and rarely disinfected when they should be! Article citation: Barnes SL, Morgan DJ, Harris AD, Carling PC, Thom KA. Preventing the transmission of multidrug-resistant organisms: modeling the relative importance of hand hygiene and environmental cleaning interventions. Infect Control Hosp Epidemiol 2014; 35: 1156-1162. Thanks Jon for reminding me/us that ALL surfaces are important! Clearly hand hygiene will have a significant impact on reducing the spread of infection. Unfortunately I have witnessed many times the lack of compliance with protocol. I do believe patients, families and visitors also need training. Perhaps reminding each other will improve the frequency everyone actually washes there hands. At the APIC national conference an Infection Preventionist told me about a new program in their facility. Part of the admission process includes hand hygiene training for the patients and their family/visitors. An easy program to implement. Next thing we need to address are the surfaces. Thanks Linda you are absolutely right I passed your opinions to my colleagues in case they don’t believe me !!!! !